Syniverse had an amazing, busy time at Mobile World Congress Americas this month. During the three-day event, we unveiled our new brand and became “the world’s most connected company,” showcased our newest solutions at the Innovation Theater on the show floor, and discussed what to expect with the transition from 4G to 5G. Let’s dive into highlights from the week! The Syniverse booth was the scene of a busy schedule of Innovation Theater sessions at Mobile World Congress Americas 2018. Our new tagline characterizes Syniverse’s commitment to unlocking the opportunities of a more connected world, and it perfectly describes what Syniverse is today. As the business landscape has evolved, we’ve re-equipped ourselves with a new set of tools that will allow companies in every industry to expand their reach and gain the most value from the digital transformation shaping today’s fast-moving technology world. Our booth at the show and the reception we held there reflected our new brand. As shown throughout the booth, our new brand journey is more than just a logo and color update. We’re changing how we face challenges, how we interact within our organization and how we engage with our customers. The bold look of our new brand elements and the integration of this in a first-of-its-kind booth acted as visual cues to announce the new Syniverse. Our brand unveiling is the first step in a new journey for Syniverse, and one we’re excited to share more on with you soon. Another highlight of the event was our new Innovation Theater – our in-booth demonstration center that showcased sessions on a host of topics, spanning from Rich Communication Services, or RCS, to 5G, to text messaging. 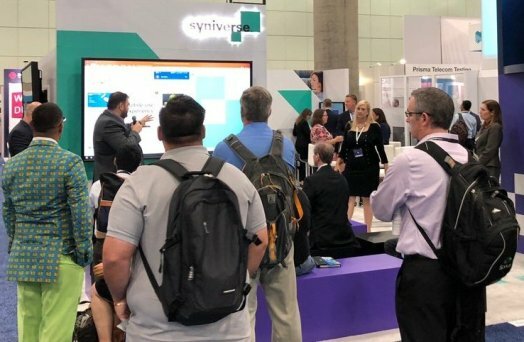 The Innovation Theater itself was a demonstration of the work that Syniverse is doing to guide our customers through a time of digital transformation and risk mitigation. The seats in the Innovation Theater utilized LoRa, a “long range,” low-power wireless communication technology, and used Syniverse Secure Global Access, the largest private network ever built for bridging mobile ecosystems, and one designed to empower businesses to protect their data when the internet of things and other technologies are creating ever-greater levels of risk on the public internet. Together, LoRa and Syniverse Secure Global Access were integrated in a new service we demonstrated that shows which seats are being occupied in a particular location. The technology was developed at our new Syniverse Innovation Lab at our headquarters in Tampa, Fla.
On the final day, I had the privilege to join a panel presentation, “4G to 5G Transition.” The panel featured thought leaders from Nokia and Intel, among others, to discuss the challenges and opportunities this change offers. I emphasized the importance of security when it comes to 5G. For this new technology to grow, we must limit the liability, and I discussed how our new Syniverse Secure Global Access offers a private-network solution to address the vulnerability and risk of the public internet. Similarly, I also discussed how Syniverse is helping our customers navigate the latest wave of digital transformation. For more than 30 years, we’ve served as a guide, translator and problem-solver between communication service providers like mobile operators and businesses like retailers, and this history perfectly positions us to lead the transition to 5G. We had an unforgettable week at Mobile World Congress Americas. We’ve launched our new brand at an inspiring moment for our company, and we’re walking the walk of a new brand that reflects our company’s promise of a more connected world and a new dedication to our customers. We hope you’ll join us on this new journey and stay tuned for more updates here on Synergy.